Oh oh oh - What's Machinima got to do with it? The word Machinima was invented in the mid - 90's and stands for "machine cinema, or film done on machine". It is another term we recognize through it's mention in the news. Here Pooky talks about what this new genre of film means, and why. Although it might be a destination it also represents and medium which is increasingly developing into a brave new art form. 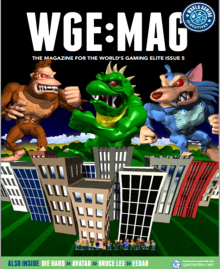 Resident Director Russell Boyd interviewed for World Gaming Executive magazine! Turn right now to page 15, if you are reading this blog then you want to know more about the fabulous director who makes some of the most astounding machinima movies around. Pooky got the opportunity to interview Russell and explore his remarkable indepth knowledge of this intriguing medium. It is an interview well worth reading for its enlightening answers. Vector Inspectors was recognized on many levels by this educational film festival. Many thanks to the educators whose work truly inspires all of us in our work in Virtual Worlds. Inworld reporter Janey Bracken turned in a pretty cool interview with Pooky about the Vector Inspectors Public Service Announcement, which has been an incredible successful, in terms of participation and hitting its target audience. Here some reflections and remarks on the film and machinima you might enjoy.